Today was the day I finally decided to plant my new Aggies out into the back garden with the others. 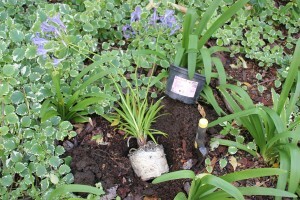 I bought two Agapanthus “New Blue” on the 15th January and I’ve had them standing in a pot outside my office. They’ve been flowering profusely since I got them, and still are. (I often buy plants and then spend quite a long time deciding where to plant them, moving them around the garden in their pots until I find a good spot … then I plant). As I cut open the pots today I discovered that they were VERY root bound … I’ve never actually seen a plant quite this root bound before and I was quite shocked, so ran to get my camera so I could show you. 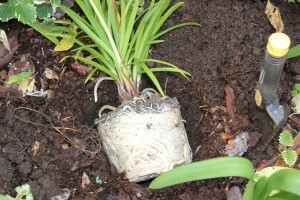 I’ve just “googled” this and found out that to get Agapanthus to flower, you should “overcrowd” them or if they are in containers, let them get root bound as this causes them to flower. No wonder mine have been flowering for 6 weeks without letting up! I guess now the roots will have lots of room to spread out the flowering will end. As I have a ton of work to do for the business this weekend I got all my weeding and planting done early this evening. Begonias, ground covers, lavender, impatiens all planted. Chris, I laugh out loud, when I saw this post. I have the same problem. These plants are amazing with a strong will to survive. I have one that is so pot bound and has had no food for years. Still holding on for me. Thank you for the inspiration to repot it! Yes, I have to say I was horrified when I saw this – I mean, I’ve seen root-bound plants before (my own indoor plants have become root-bound in the past) but nothing like this. There was hardly any soil – a teeeny bit on the very top. And this from a reputable nursery! I really didn’t expect this. I think I’ll take do what you say Donna and pull them out the pots at the Nursery in future. (I’ll print this photo and keep it in my wallet … then if they get mad I’ll show them why I’m doing it!!). I too am shocked. Had this not lived in a nursery getting daily fertilizer applications, it would have been toast. I hope you can get it going on its own again, feeling soil for what looks like its first time. I always pull them out of the pots in the nursery before purchase, and I don’t care how mad they get. Well, you have taught me something today – the root-bound plant that flowers! Very interesting! I will be interested to know how it grows in your garden and if it flowers. I am also envious you got time in the garden today! I have a whole list of things to do – weeding (a lot!!) and tying up my tomato plants. There are so many tomatoes that the bushes are drooping. And this darn wind does not help!! Gonna get up early and get into the garden!! Don’t work too hard, my friend!